GOAL 2: Significantly strengthen and grow the base of distinctive graduate and professional programs that assure development of the next generation of researchers and societal leaders. Since the start of the Strategic Plan in 2011, Georgia State has continued to increase the number of its graduate and professional program offerings, now with more than 150 degree and certificate programs at the post-baccalaureate level. Georgia State’s graduate and professional programs also continue to grow in quality and reputation. In 2019, U.S. News & World Report used qualitative and quantitative measures to rank programs for its survey of best graduate schools in the United States. Programs of individual disciplines are based on peer assessments by academic leaders across the country. The Andrew Young School of Policy Studies moved from 18 to 21 in the magazine’s overall ranking of public affairs schools. Its individual disciplines continued to rank highly. Its program in local government management ranked seventh, nonprofit management ranked ninth, public financing and budgeting was eighth, public management and leadership was 19th, public policy analysis 22nd and urban policy eighth. Its program in local government management went from eighth to seventh. The Byrdine F. Lewis College of Nursing and Health Professions moved up from 117th to 99th in the overall ranking of nursing schools. Its doctoral program went from 132nd to 126th. The College of Education and Human Development ranked 45th in the nation. Its counseling program ranked 11th, its curriculum program 23rd, its ranked elementary teacher education program was 21st, secondary teacher education was 22nd, and student counseling and personnel services was 11th. The College of Law ranked 67th in the nation overall. It ranked second in health care law and its part-time program ranked 13th, its program in clinical training was 26th and dispute resolution was 44th. Environmental law ranked 103rd, international law 78th, tax law 43rd, trial advocacy 21st and legal writing 75th. The Robinson College of Business ranked 48th in the survey of part-time MBA programs. Its information systems program ranked 13th (up from 17th). In health-related areas, the university’s program in health care management ranked 39th and public health was 56th. Rehabilitation counseling was 55th and social work ranked 59th. As the university continues to improve upon its accomplishments under Goal 2, the institution is also expanding its support for graduate students and making greater efforts in programming, recruitment and retention. INITIATIVE 1: Expand support for doctoral programs. An Office of Graduate Studies was established, and an Associate Provost for Graduate Studies was appointed in 2014 to increase focus on doctoral- and master’s-level programming, recruitment and retention. Professional development workshops for graduate students addressing a range of topics occur monthly, and the first campus-wide Graduate Student Orientation was held in fall 2015. About 415 new graduate students attended the orientation session in fall 2017. The University Fellows Program was started in 2011 as a university-funded program to increase the quantity and quality of doctoral students enrolled at Georgia State by providing assistantships for the best students in strategic areas. As of spring 2018, the program has supported more than 202 doctoral students since 2011, with a budget of approximately $2.7 million annually. Through the Provost’s Dissertation Fellows program, 43 fellows have been funded as of spring 2018. Thirty-three have graduated, and completed their degrees an average of 2.3 years earlier than their peers in the same degree program. Each fellow can receive a maximum of $24,000 — $2,000 a month for 12 months, with many fellows graduating in less than the 12-month time limit. Thirty new students are slated to join Georgia State in fall 2018 as Second Century Initiative Fellows. The Second Century Initiative (2CI) and its successor, the Next Generation Program, have provided funding to increase the quality and reputation of the university’s research and scholarship through new faculty hiring as well as graduate student support. Read more about the programs at https://nextgen.gsu.edu. The Office of Graduate Studies’ Final Year Fellowship Program targets students’ progression to degree completion by providing a monthly stipend to support doctoral students completing dissertations. A fellowship adviser assists graduate students applying for prestigious awards from foundations such as Fulbright, Ford and Mellon and federal agencies, such as the National Institutes of Health and the National Science Foundation. 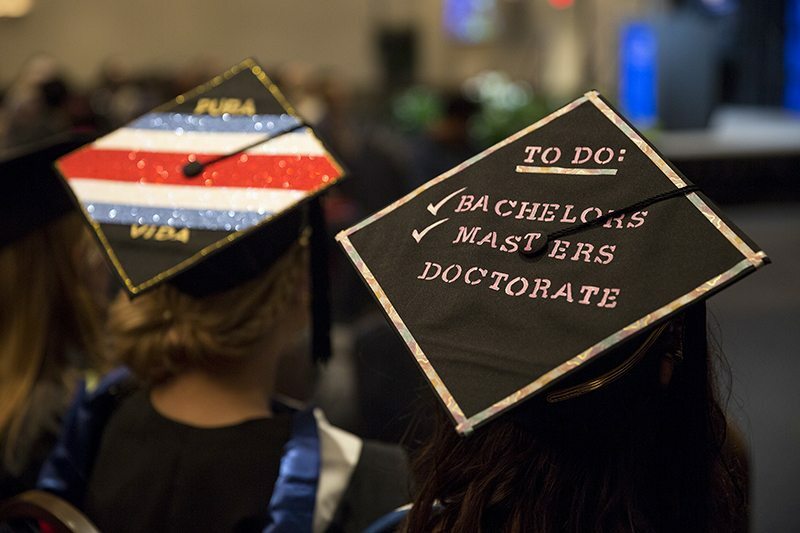 The Office of Graduate Studies and the Office of the Vice President for Research and Economic Development also provide up to $2,000 to help with expenses related to completion of dissertations. As the U.S. becomes more diverse at large, diversity among professionals in academia is not yet keeping pace — including professors and senior academic leaders. It’s not just in academia, either. Diversity in professions such as medicine and law suffer, too, especially in top positions. The pathway to become a member of senior academic leadership may require individuals to earn their bachelor’s degree and go on to pursue a graduate degree, typically a Ph.D. for many university positions. One way to help address the lack of diversity in more senior positions is to catch curious students in college and turn them on to their potential to succeed in graduate school and beyond. Georgia State, known for helping undergraduate students from all backgrounds succeed, and an institution serving an increasing number of graduate students from racial or ethnic minority backgrounds, is elevating its focus on student success in graduate and professional degree programs. One new approach is housed in the Center for the Advancement of Students and Alumni (CASA), established during Academic Year 2017-18 to help encourage and support students from underrepresented populations to enter advanced degree programs that can lead to academic and professional careers. These career paths can result in leadership positions in academia and other sectors. Just as Georgia State has become a leader in using predictive analytics to identify problems among students at risk for academic challenges, CASA is exploring the use of predictive analytics to identify potential among students who might have the curiosity and motivation to succeed in graduate school or a professional program. These analytics may assist faculty and others in spotting high-potential students to invite for participation in CASA programming. Interested students will also be able to nominate themselves to participate in the center’s programming. CASA programming also includes professional development workshops, support for standardized tests used for graduate admissions, assistance in developing strong applications to advanced degree programs, alumni panels, workspace and walk-in hours to ask questions and gain advice from faculty and staff. CASA leaders are also happy to help students find offices on campus to help with financial aid questions and academic advising. These services are made available to students and alumni. By percentage. Hover over graph to view numbers. INITIATIVE 2: Leverage our national reputation in professional degree programs for the development of societal leaders. Interdisciplinary and professional degree offerings have been implemented and include Doctor of Education, Doctor of Nursing Practice, Doctor of Public Health (fall 2018), a Master of Science in Analytics, a dual MPH/JD program, Master of Laws (LL.M. ), Bachelor of Interdisciplinary Studies in Health IT, and a new Entrepreneurship minor that can be completed as part of any undergraduate degree at the university. Additionally, several specialized programs designed to develop leadership and professional skills have been initiated or expanded. The Women Lead Program provides undergraduate female students access to community partners, leadership training, networking and strategic career development to encourage them to strive for top leadership positions across various sectors upon graduation. The program engages young women through learning in the classroom, developing mentoring relationships, and organizing and leading programs on campus. The Panthers on Wall Street (PWS) Program immerses promising students in the heart of America’s financial district. It includes 20 undergraduate and master’s students who are competitively selected and travel to Wall Street to visit with top firms. Since the program’s inception, 25 percent of PWS participants now work in New York City. The program is self-sustaining as donations from PWS alumni provide the funds necessary to run each year’s program. The J. Mack Robinson College of Business has introduced Panthers in the Valley, a signature program that immerses students in one of the world’s most innovative business environments – Silicon Valley. Panthers in the Valley exposes students to Silicon Valley’s unique entrepreneurial and innovative culture. This allows participants to compete for internships and full-time jobs in Silicon Valley while at the same time providing area employers access to top talent from one of the most diverse student bodies in the United States. The trip includes meetings with early stage start-ups, venture capitalists and technology stalwarts. In the heart of Atlanta’s financial district, Georgia State’s Buckhead Executive Education Center is the primary location for students studying in the graduate or executive programs offered by the J. Mack Robinson College of Business. Opened in 2005 as the location for Robinson’s Executive MBA Program, the Center serves thousands of students participating in more than 20 different degree-programs, including the new MS in Analytics, and in non-degree programs. The center features technically advanced lecture-style classrooms, flexible classrooms, numerous conference and group study breakout rooms.